Infiniti has given us the first hint of the true nature of the new engine for the upcoming special edition of the Infiniti Q50, named “Eau Rouge” in prototype form. The nature of that engine is strongly hinted at by the sound clip below… where high-revving and blow-off valves are so obviously present…. and just a hint of an F1 engine “scream”. Or at least that’s our wishful interpretation of the sounds they are teasing us with! And stay tuned because on March 4th we’ll see the announcement. Geneva / Hong Kong – Infiniti has today released a new preview of the Q50 Eau Rouge concept – the sound of premium automotive performance. The identity of the big personality engine with forced induction under Eau Rouge’s sculpted and vented hood will be revealed at the 2014 Geneva International Motor Show, but it can be heard now in a new video clip released by Infiniti. 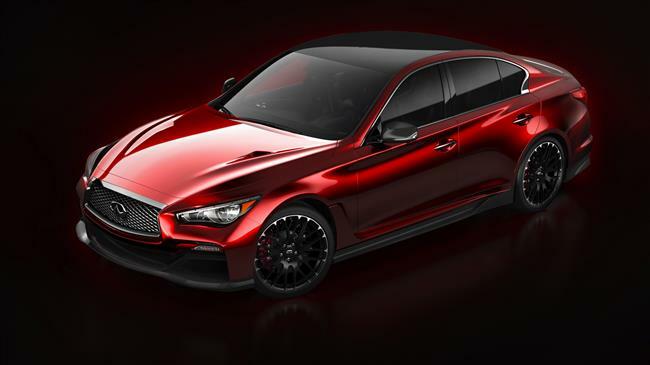 The Infiniti Q50 Eau Rouge concept was revealed at the 2014 Detroit Auto Show in January as a design vision for a high-performance variant of the Q50 premium sports sedan. Now, after significant interest from the public, Eau Rouge boasts an almighty powertrain that suits the aggressively styled and motorsport-influenced exterior. The most powerful Infiniti ever has not been confirmed for production, but Infiniti will continue to listen to feedback from potential customers. “With its Formula One-inspired carbon fiber bodywork, we thought it only fitting the Q50 Eau Rouge’s beating heart was suitably sporting. Our engineers have perfectly captured the tone of Infiniti’s take on premium performance, and a car that is as impressive as the Q50 Eau Rouge sounds is surely a car to challenge performance cars in the premium sector,” said Johan de Nysschen, President of Infiniti Motor Company Limited. Infiniti will hold its 2014 Geneva International Motor Show press conference at 11:00 am CET on Tuesday, March 4.